With most households yet to make the move to biometric lock systems, many of us are still carrying around jangly keychains. And with keychains also attracting non-key items such as USB flash drives, mini-torches and the all-important bottle opener, they can quickly reach pocket bulging, Kramer-esque proportions. 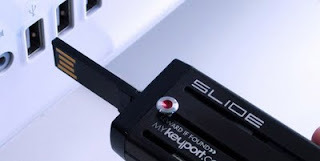 The Keyport is a pocket friendly, Swiss Army knife-like solution that can consolidate all these aforementioned items in one streamlined device and provides access to them with a flick of a thumb. At about the same size as a traditional auto key fob, the Keyport holds up to six keys within its stainless steel exterior with each identified by differently colored sliding knobs. The device is fitted with key blanks which then need to be taken to a locksmith for cutting. The company also offers options for auto keys fitted with transponder chips in the head, however not all keys are compatible. For some non-key functionality, the Keyport can also be fitted with a variety of different blade inserts, including RFID, USB flash drive (4 or 8 GB), bottle opener and LED torch. Blades can also be removed and inserted so users can switch them around to suit different situations. Such key carrying convenience doesn't come cheap, however, with the Keyport starting at US$79 for a standard six blade bundle, while a chipped auto bundle starts at $94.